The midstream sector isn't homogeneous -- there are a lot of different business models that fall into the space. In other words, you can't look at every midstream company the same way. For example, USA Compression Partners LP (NYSE:USAC) and CSI Compressco LP (NASDAQ:CCLP) offer investors yields of 12% and 13%, respectively, but they provide a niche service, and results can be volatile. Most income investors will be better served by something a little more boring. Here's why you should avoid these two yield traps -- and an alternative that should be able to keep distributions coming in good markets and bad. Pipelines are a vital link in the energy industry. They help move oil and natural gas from where they are drilled to where they are processed and used. But you can't just put oil or natural gas into a pipe and hope for the best; you need pressure to help ensure speedy movement through the line. That's a simplification, of course, but it provides a basic picture of what master limited partnerships USA Compression Partners and CSI Compressco do -- as their names imply, they offer compression services. While a necessary business, demand for compression goes up and down with the amount of amount of energy being pushed through pipelines. That's not inherently bad, but the business is asset heavy, and leverage tends to be material. Material leverage and volatile revenues can create a problem. USA Compression Partners' ratio of financial debt to equity is roughly 1; CSI Compressco's ratio is at 2.75. While a financial debt to equity ratio of 1 isn't outlandish, it isn't low, and 2.75 is pretty high. For comparison, Enterprise Products Partners LP (NYSE:EPD), which own pipelines and other assets, has a financial debt to equity ratio of just 0.4. Leverage can be great when things are going well, but can cause problems when times are tough. In 2016 and early 2017, a difficult period for energy markets, demand for CSI Compressco's services was relatively weak. The utilization rate of its assets was in the mid 70% range, leading to a distribution coverage ratio in 2016 of 0.99. In other words, the cash flow the partnership had available to pay distributions was one basis point shy of covering the full distribution. That's not great, but distribution coverage was even worse in the final quarter of the year at just 0.68. It's little wonder that the partnership chose to cut the distribution by 50% shortly before announcing first-quarter 2017 earnings (the second cut in roughly a year). USA Compression Partners is in better financial shape, but the same basic logic applies to the company's business. As demand ebbs and flows, so do its results. After 10 consecutive quarterly increases, the partnership's distribution has held steady since late 2015. That makes sense, given that the distributable cash-flow coverage ratio in 2016 was 1 times and fell to 0.89 times in 2017. Distribution coverage is back over 1 at this point (without the need for a distribution cut), but the coverage weakness in 2016 and 2017 shows the inherent volatility in the business. 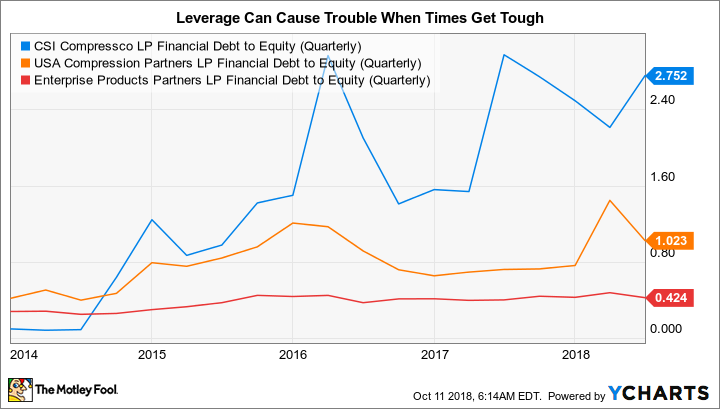 CCLP financial debt to equity (quarterly) data by YCharts. The high yields here are enticing. But for income investors, the uncertainty in the businesses isn't worth the risk. CSI Compressco's distribution cut shows exactly what can happen when times get tough. Which is why a midstream company like Enterprise Products Partners, despite having a yield that's about half as large at roughly 6%, is a better option. Enterprise, one the of the largest midstream companies in North America, owns a large collection of fee-based assets. It is a toll taker, often signing take-or-pay contracts, which require payment even if the customer doesn't fully utilize an asset. And, as the leverage metrics above highlight, Enterprise takes a fairly conservative approach to its balance sheet. The real proof of the partnership's conservative nature, however, is in the distribution numbers. Distribution coverage, despite industry headwinds in 2016 and 2017, has remained above 1.2 times in each of the last five years. The dividend, meanwhile, has been increased annually for 21 consecutive years. Those are numbers that let investors sleep well at night. CCLP dividend per share (quarterly) data by YCharts. Enterprise, meanwhile, is working to become even more conservative today. It is slowing distribution growth from its historical mid-single-digit rate to the low single digits so it can self-fund more of its own growth. That will allow the company to avoid issuing dilutive units to fund growth and reduce its cost of capital over time. While that's having a notable impact on the distribution coverage today, pushing it even higher, the longer-term impact is more important: Enterprise's business model will be even more conservative in the future than it was in the past. And that should make the distribution that much more secure. If you are an income investor looking for a reliable income stream backed by financially strong and steady businesses, then CSI Compressco and USA Compression are not the right choices for your portfolio. The yields are enticing, but the businesses backing those double-digit yields are volatile. 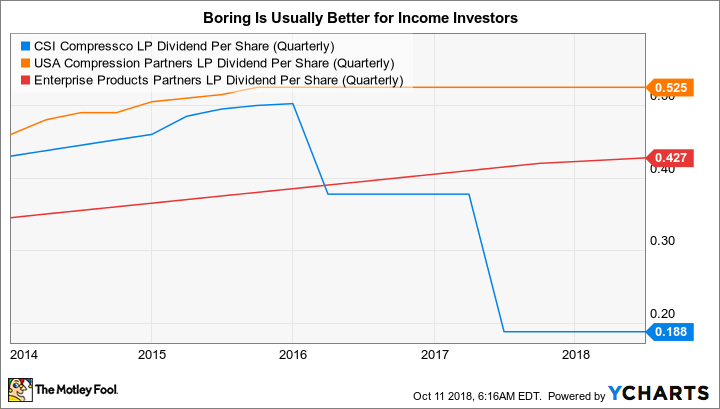 You're likely to be better off with a boring, conservative midstream player like Enterprise Products Partners, where there's little concern that the still-generous 6% yield won't survive a downturn.